The Officejet J5780 printer has served us faithfully for many years though the hand feed often produces a black vertical line down one side. However, my daughter bought various specialist gloss printing paper (A4) and although she found one set that produced good quality, whatever she tried there was always a white margin down the right hand side with the left side cut off, and the heading also trimmed off the top. We've never had this problem for normal colour printing, so I assume that our printer can't accept quality gloss printing paper? So does she need to buy a specialist printer? I have an Officejet J5780. Does the black cartridge incorporate the toner? My printer tells me my toner is low and I get faint black print outs. I'm thinking of buying the recycled cartridge as printing requirement is low. Advice appreciated? An incredibly useful printer, the HP Officejet J5780 is capable of producing up to 30 black ppm and can perform a number of tasks from printing to faxing. You may be tempted to use the HP Officejet J-5780 constantly without pause but the trouble with using the HP Officejet J5780 on a regular basis is that the Officejet J-5780 accessories such as the black HP Officejet J5780 ink may be costly to replace and this can restrict your printing. Luckily, we at CartridgeSAVE can get you cheap HP Officejet J5780 ink cartridge with great service-just compare our HP Officejet J5780 cartridge prices with other leading HP Officejet J5780 ink suppliers to find out. Buy an Officejet J5780 cartridge from CartridgeSAVE and rest assured you’ll save money with our discount prices! Buying the HP Officejet J 5780 ink cartridge online has never been this easy as we’ve designed the HP Officejet J5780 ink ordering process to be as simple as possible. You can order the HP Officejet J-5780 cartridge with confidence as we only deal with genuine quality Officejet J 5780 ink-and to prove it to you we send every HP Officejet J5780 ink cartridge off with a straightforward money back guarantee. Don’t forget, we also guarantee free delivery of every HP Officejet J-5780 ink cartridge so that we can save you as much money as possible. Finding the right printer for your office is by no means a task which you will want to undertake lightly. That being said, it is not a hugely time consuming and challenging prospect either, especially when there are models such as the HP Officejet J5780 on offer. The HP Officejet J5780, an Officejet printer from the team at Hewlett-Packard, is a total beast of a machine and in order to help you better understand the pros and cons of the HP Officejet J5780, here is a brief guide. An office based printer is unlikely to be overly handsome, but the HP Officejet J5780 manages to offer a basic level of design at least and on that front, it should be commended. 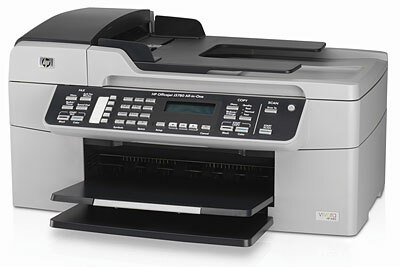 The HP Officejet J5780 has a very sizeable user interface, but it is still very easy to operate. Colour wise, the HP Officejet J5780 is simply designed and offers a subtle grey and charcoal exterior. In the simplest terms, the HP Officejet J5780 works like the employee we all wish we had. It never stops! The HP Officejet J5780 will provide professional quality documents in no time at all and as such, this is a very promising printer for anyone who is seeking to bulk up their office space with a reliable machine. There are really only a handful of negatives where this printer is concerned, if that! The HP Officejet J5780 might not be overly pretty, but it does everything you would expect of it. As such, if you are on the lookout for a brand new office printer, you could do much worse than pick up an Officejet J5780.